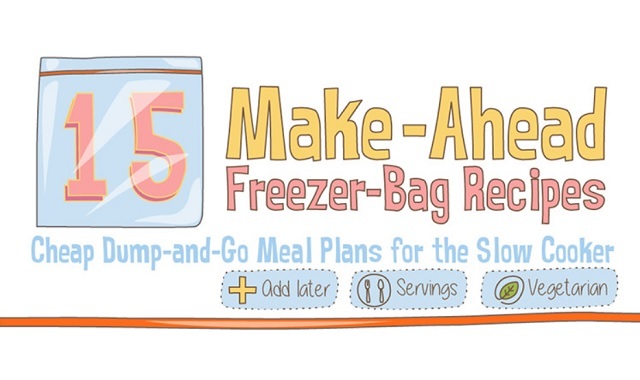 15 Make-Ahead Freezer Bag Meal Recipes #infographic ~ Visualistan '+g+"
Too busy to make a home-cooked meal during the week? Not anymore! With dump-and-go freezer-bag meals, you can do all of your meal prep in one afternoon. Then, on the day of, pull your bag from the freezer and dump it right into your slow cooker. A full dinner for you and your family will cook while you work, and then you’ll have a meal with very little prep to do once you get home. These 15 slow-cooker meals are super cheap – the ingredients for these recipes often stay well under twenty bucks – and healthy. (We included some vegan and vegetarian dinner options as well!) So whether you’re trying to save money, get fit, or just take better care of yourself and your family, you can do so without getting insanely busy. TitleMax has organized some of the best and most popular freezer meal recipes out there, but there’s literally hundreds to choose from. Take a Sunday afternoon and pack a few of them away. You’ll see how incredibly easy it is to do make-ahead meals!